flattened beneath their broad black wings (4). As a reader, I'm both compelled forward, and at the same time, with the specificity, the concreteness of the images, I'm asked to meditate, visualize—I'm ushered in to the speaker's mindscape, asked to trace my fingers along the path of grief, of remembering. The poem continues to describe the memory, clouded with a fog of horrible beauty, addressed to the deceased: . "you were bleeding in my lap/on the road's black gash," "They found you in the desert/girl of dark petals, unfurled/ to the cracked sun," and then, finally, the disorientation that follows grief, "Dust/curling over the mountains/erases my face. I forget to sleep." The poem ends with an image of birds, birds which reappear throughout the collection like the omnipresence of pain who "unsnap the spirit from its bone-cage." We are reminded of Magdalena's narrative again later in the book which further explores this journey through grief and loss, but again, this is a book of blurring boundaries, and she is in each image: in the crows, the moth, the ash, which reoccur in just about every piece. And while grief is something deeply personal, Foerster's poems, too, explore a more communal sense of grief, of loss, of longing. In the poem "Leaving Tulsa," the speaker returns to a grandmother's, Cosetta's, land, her "Indian allotment" after the funeral. And here, yes, the poems are deeply personal, telling a narrative through specifics from remembering a "monsoon of frogs" to memories of "fishing for dragonflies" to the "bundle of beads" the speaker's grandma buried beneath the roots, but also, of a people. The grief becomes communal when the speaker remembers Cosetta's words and what happened following her death: "They tell/the story of our family. Cosetta's land/flattened to a parking lot." (10) Here, we're exploring the grief, the loss, of land, of culture. Foerster, herself identifying as both European and Muscogee descent, explores a complex notion of identity through her works. A particularly powerful poem, "Vanishing Lessons" gives the reader instructions, with a rather tongue-in-cheek tone, as to how to disappear, or perhaps, how to make a part of one's self disappear. "Gather the bones,/mortar them with sugar, add a capful of whiskey and corn cake flour. Stamp flat." and, as the poem continues, gains intensity, gains urgency: "Eat her. Pretend you didn't," ". teach her to read,/to enunciate the words infidel/and whore." and finally, ".send her to the curbside/up the hill from her ghosts. Tell her to wait," (30). These instructions, presumably alluding to the forgetting, the disappearing, the drowning out of the Muscogee culture and heritage, are heart-breaking, difficult, and powerful acts of remembering in and of themselves, of acknowledgement, of healing, in both a micro and macro sense. Too, the poems in this collection are peppered with references to the author's European descent. Particularly in the poem, "Fugue," (which almost brushes up against "Vanishing Lessons," providing a compelling contrast), the speaker reflects on blood, passed from generations of women: how hands "bloomed edelweiss," of drinking "teas of birch bark, alpine rose/ to drown the sounds of wolves," to diving "into the Danube" (32). This tension of cultures, of languages, of images coexist and blend together in this collection in an interesting way, blurring the boundaries of colonized and colonizer, providing a multifaceted reading that complicates our understandings of identity. Instead, identity here, it seems is linked to the land itself, the earth, the ash, the birds. Ash in my mouth (75). 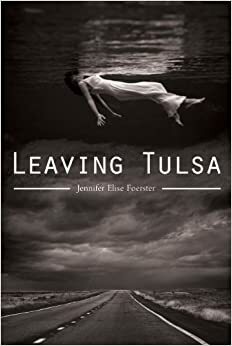 Leaving Tulsa is an ambitious first book of poems that maps the complexities of identity, of grief, and how it's all tied to the landscape beneath our feet. It attempts to articulate through specific, concrete and clean images that which would otherwise be unspeakable, to blur the boundaries of self and place. Foerester teaches us to look around us, to examine "each leaf/ underfoot" to find "the story of you" (38). It is a lesson worth learning, and the book, as whole, is a testament to the power contemporary poetry holds to usher readers towards understanding of the grit of who we are. is the author of three poetry books: a collection titled The Garden, Uprooted (Slough Press, 2012) and two chapbooks titled Among the Mariposas (Mouthfeel Press, 2010) and The Garden of Dresses (Mouthfeel Press, 2012). Her reviews have been included in publications such as Rattle and Fifth Wednesday Journal, in addition to being a regular reviewer for Boxcar Poetry Review. She teaches writing at the University of Texas Pan American and lives on the southern tip of Texas with her love, Bruno, and their many, many cats.